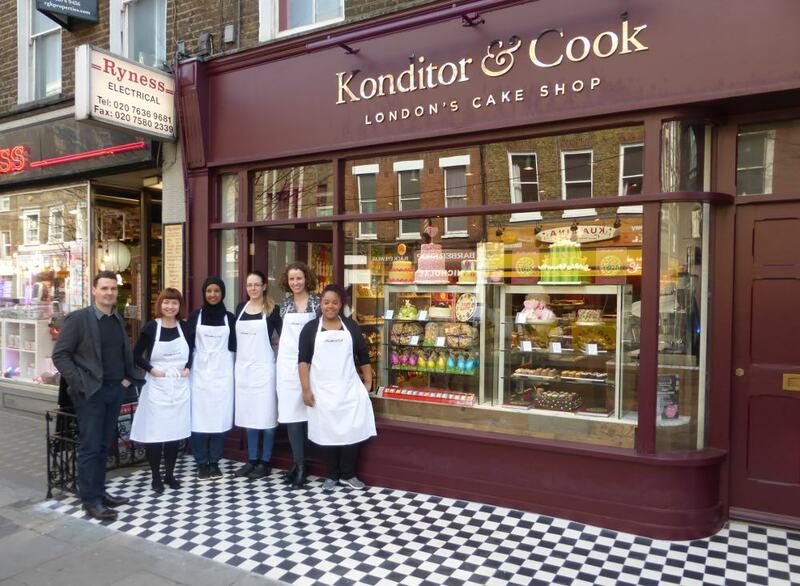 Goodge Street’s newest shop sells cakes that are “made with love and taste delicious”, says Stephanie Buchanan who’s been with Konditor & Cook just seven weeks and is now managing the new store. Daron, Ewelina, Aban, Eva, Stephanie, and Naomi, outside Konditor & Cook’s newest shop in Goodge Street. The Goodge Street bakery which opened to serve customers at 11 am this morning adds to the small number of premises the company has in London. “The cakes are baked at our other store in Gray’s Inn Road, only 10 minutes drive away,” says Stephanie. The shopfront has been improved with a new wooden frame and glass and the distinctive curved window next to the upstairs doorway has been preserved. The chess board black and white floor tiles on the forecourt of the shop have been repaired and extended along the full width of the shopfront. Daron Goldfinch who is operations director of the company is proud of the the work they did to improve the shop and said they chose the site as it was conveniently located near a tube station. “We find customers want to pick up a special cake on the way home from work,” says Daron. The company’s website says the shop is located in “pretty Fitzrovia”. Konditor & Cook was founded by Gerhard Jenne who was born in Freiburg, Germany. The first bakery and food shop was opened in Cornwall Road, Waterloo, in 1993. Konditor & Cook, 39 Goodge Street, Fitzrovia, London W1T 2PX. Opening Times: Monday to Friday 8:00-19:00, Saturday 10:00-19:00, and Sunday 11:00-18:00.